These seminal texts by pioneering filmmaker and feminist Germaine Dulac will be of great interest to film scholars and cinephiles alike. From theoretical essays on the avant-garde to those asserting the value of documentaries for society, Germaine Dulac determines to elevate cinema as art and to engage the public in the process. 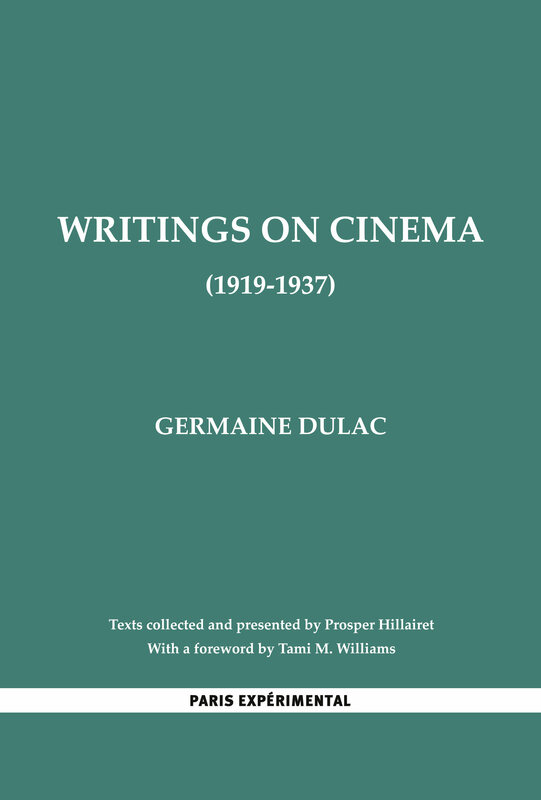 I am delighted to find that Germaine Dulac’s important writings on the cinema are now available in English and accessible on line. When I first began work on this seminal feminist filmmaker 45 years ago almost all of her critical theoretical writing and all but two of her films were inaccessible. At the time, Prosper Hillairet’s magisterial book published by Paris Expérimental provided a much-needed collection of Dulac’s texts, but they were all in French. Paris Expérimental has done us all a great favor by updating, translating, and putting everything on e-book so that we all may see the visionary brilliance of this pioneering feminist filmmaker. Sandy Flitterman-Lewis, Associate Professor of English and Comparative Literature, Rutgers University, author of To Desire Differently: Feminism and The French Cinema. Germaine Dulac is among the most important figures of French silent cinema, even world cinema tout court. An adventurous filmmaker, subtle theoretician, and powerful feminist with a non-conforming sexuality, she bridged ‘Impressionist’ and Surrealist cinema, ending her career with documentary films in the politically turbulent 1930s. Her writings, made available in English for the first time in an excellent translation by Scott Hammen, are simply a must-have for any scholar or lover of cinema as well as for scholars of gender and sexuality. Paris Expérimental and Prosper Hillairet were instrumental in the revival of Dulac’s standing in world cinema history, and they are to be lauded for offering her complete writings to English-speaking readers. Dulac is a giant–as her main specialist in the US, professor Tami M. Williams has advocated for decades–and it’s time her writings and her films were taken into account. Christophe Wall-Romana, Associate professor, University of Minnesota. A pioneer of cinema, Germaine Dulac (1882-1942) is one of the major figures of the 1920s French Avant-Garde. Hugely influential, she founded and directed numerous organisations and, in parallel, was a tireless activist in the defense of women’s rights. In her films, Dulac explored new possiblities of expression in cinema. She directed over twenty films starting in 1916. Among her notable films are La Souriante Mme Beudet (1923) and La Coquille et le Clergyman (The Seashell and the Clergyman, 1927), from a scenario by Antonin Artaud. Writings on Cinema presents another side of her multi-faceted career as filmmaker and feminist: Dulac as writer, theoretician, and public speaker. The book brings together her principal texts, interviews, and speeches, where, in her passionate style, Dulac presents her concept of cinema. She argues for a cinema of liberation, of unbounded creativity, striving to define the inate qualities of the new art form around a key concept of the French avant-garde: cinema as motion. She addresses the major issues of the era such as the coming of sound and color, film as an educational tool, and, above all, how the cinematic image is a reflection of the modern age. This reflection on the concept of representation, an in-depth exploration of the cinematic theories of the 1920s, has lost none of its force and relevance today as new technologies and approaches to image-making emerge. Fondées en 1985 par Prosper Hillairet, Christian Lebrat et Giovanna Puggioni, les éditions Paris Expérimental se consacrent essentiellement au cinéma d’avant-garde et expérimental.